Lindal Cedar Homes has launched a new line of modern homes inspired by architect Frank Lloyd Wright. With the help of the Frank Lloyd Wright Foundation, the Lindal Imagine Series offers harmonious, post-and-beam home designs ranging from 900 to 3,000 square feet. “The Lindal Imagine series reflects a modern embodiment of Frank Lloyd Wright’s principles; sensitive to the attributes of Usonian design while meeting the demands of contemporary living." 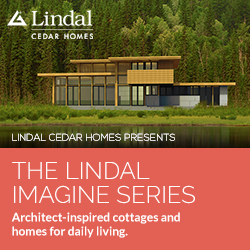 Lindal Cedar Homes has partnered with the Frank Lloyd Wright Foundation to launch the Lindal Imagine Series, a new line of modern homes, inspired by the work of architect Frank Lloyd Wright. The new effort unites the enduring design principles of Wright’s Usonian homes with current developments in technology, construction and design theory. There are seven designs for modern living enthusiasts to choose from. This is the first time ever that a home company has been licensed to produce Frank Lloyd Wright-inspired, Usonian-based home designs. The venture is also a partnership with the School of Architecture at Taliesin, which has its roots in the Taliesin Fellowship, an apprentice program initiated by Frank Lloyd Wright in the 1930s. “We have strong ties with the Frank Lloyd Wright Foundation and the School of Architecture at Taliesin, so this new collaboration makes sense,” said Josefin Kannin, marketing director for Lindal Cedar Homes. “There’s been a surge of interest in mid-century modern homes for the middle class that are affordable and aesthetically pleasing. These homes will meet that demand; they are unique, are integrated with nature, and have the feel of a much larger home. For the new series, Lindal wanted a home designed to meet the lifestyle needs of today’s families, deeply rooted in Frank Lloyd Wright’s “organic architecture” principles of harmony, sustainability, and integration with nature. These are thoughtfully designed homes, with spaces for quiet reflection and exuberant celebration. The result of the new series is a harmonious synthesis — a beautiful, functional home that accommodates and expresses the way people live today. The homes are aesthetically beautiful, modest in size—ranging from small homes and cottages under 900 square feet to larger homes in the range of 3,000 square feet—yet spacious and filled with light. They are thoughtfully designed to blend seamlessly with their surroundings, whether in a rural, urban or suburban setting. The new homes share six design principles with the original Usonian house plans: Each has open floor plans, a strong horizontal emphasis, and is integrated with nature. Additionally, every home emphasizes an interplay with light and shadow, is energy efficient, and has flexible floor plans. Homebuyers can add basements and garages, or alter the angle of the roof or its pitch. According to Stuart Graff, President and CEO of the Frank Lloyd Wright Foundation, “The Lindal Imagine series reflects a modern embodiment of Frank Lloyd Wright’s principles; sensitive to the attributes of Usonian design while meeting the demands of contemporary living." Wright (1867-1959) is recognized as one of America’s most brilliant architects. The Usonian home designs are based on a philosophy Wright called “organic architecture.” His goal was to create “a harmonious place in which to live”; thoughtful, beautiful homes made with natural materials and elements that could be mass-produced for maximum cost-effectiveness, yet custom-tailored to suit the individual needs of each and every homeowner. In 1937, the first Usonian home (Jacobs 1) was built by Wright for Herbert Jacobs and his family near Madison, WI. Wright went on to design more than 100 Usonian homes for the urban and suburban middle class. The designers for the new series are Aris Georges - who taught on faculty at the School of Architecture at Taliesin for many years, and Trina Lindal, a graduate of the School. To see all the new designs, visit: Lindal.com/imagine For every Lindal Imagine home sold, Lindal Cedar Homes makes a donation to the School of Architecture at Taliesin. The Frank Lloyd Wright Foundation, established by Wright in 1940, is dedicated to preserving Taliesin and Taliesin West for future generations, and inspiring society through an understanding and experience of Frank Lloyd Wright’s ideas, architecture and design. Wright’s legacy, reflected in contemporary work around sustainable and affordable architecture and excellence in design, is of even greater importance today than in his own time. The Foundation is forward-looking, but rooted in the history of the Taliesin communities. Please visit FrankLloydWright.org for more information on tour schedules, cultural and educational experiences and events. Lindal Cedar Homes is the world's largest manufacturer of prefabricated post-and-beam homes, made of premium Western red cedar and other high-grade building materials. The company specializes in designing custom homes for clients, built with an efficient and predictable kit of parts that can be shipped to build sites anywhere in the world. Founded by Sir Walter Lindal in 1945 (and family owned and operated to this day), Lindal Cedar Homes is a leader in home design, engineering, quality materials and customer service. The Lindal tradition is carried out around the world by hundreds of employees, contractors and independent distributors in the United States, Canada, Japan, Europe, Australia and other countries. All Lindal Cedar Homes built are backed by an industry-exclusive Lifetime Structural Warranty.